Top: Red crepe silk heavily embellished top. Bottle green application on the throat with crystals, pearls and sequins embellishments. Big circular motifs made on chest front and the whole shirt. Both front and rear hemline is heavily embellished in Paisley shape. Bottle green piping edges on neckline, sleeves and hem. Fully lined. Hidden zipper closure back. 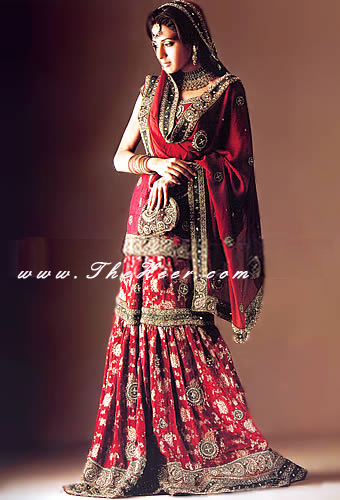 Gharara / Skirt: Red banarsi jamawar Lehenga has been heavily embellished from hemline and gote (knee belt). With large and small circles embellished hemline have been completed by pipes at the edges. Fully lined. Hidden zipper at side. Dupatta / Veil: Black chiffon dupatta has been heavily embellished from four borders, with small and large circular motifs all over. Piping at edges. 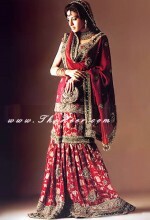 Embellishment work includes beads, sequins, Swarovski crystals, diamonds, kora, naqshi, kamdani and application work. 100% hand embellished. 100% pure imported fabric. Made in Pakistan. Click the button below to add the BW8823 Red Banarsi Jamawar Lehenga to your wish list.